The Phillies finished last in 1992, so their presence in the World Series was something of a shock. The Blue Jays, on the other hand, entered as defending World Champs. Game 1 in Toronto was a tight affair until the seventh, when the Blue Jays scored three times to make the score 8-4. The Phils came up with an unearned run in the ninth off Jays closer Duane Ward, but the final was 8-5. The National Leaguers came back to capture Game 2, as they scored five times in the third -- highlighted by Jim Eisenreich's three-run homer -- and held on for a 6-4 victory. The Series shifted to the City of Brotherly Love, and the Blue Jays were loving the Philly pitchers. Jays DH Paul Molitor tripled home two runs in the first inning, and later singled and homered, pacing Toronto to an easy 10-3 win. Pat Hentgen pitched six strong innings to gain the victory. Game 4 was the highest-scoring game in postseason history. Neither starting pitcher survived the third inning, after which the Jays led 7-6. The Phillies piled up the runs, though, and, after scoring another run in the seventh, they held a seemingly-commanding 14-9 lead. But in the top of the eighth, Toronto hammered first Larry Andersen and then Mitch Williams for six runs. Duane Ward dispatched the Philly hitters in the ninth, and the Jays had an incredible 15-14 victory. Wasted were Lenny Dykstra's double and two homers, and Milt Thompson's five RBIs. Maybe the hitters were simply tired out after Game 4, but Game 5 was a pitchers' duel, Curt Schilling topping Juan Guzman, 2-0, with a five-hitter, thus keeping the Phillies' hopes alive. Trailing 5-1 in Game 6, the Phillies broke through with five runs in the seventh, the outburst highlighted by Dykstra's three-run homer, his fourth round-tripper of the Series. That 6-5 lead would not be enough. With one out in the bottom of the ninth, the Blue Jays got two men on base, bringing Joe Carter up to face Mitch Williams. 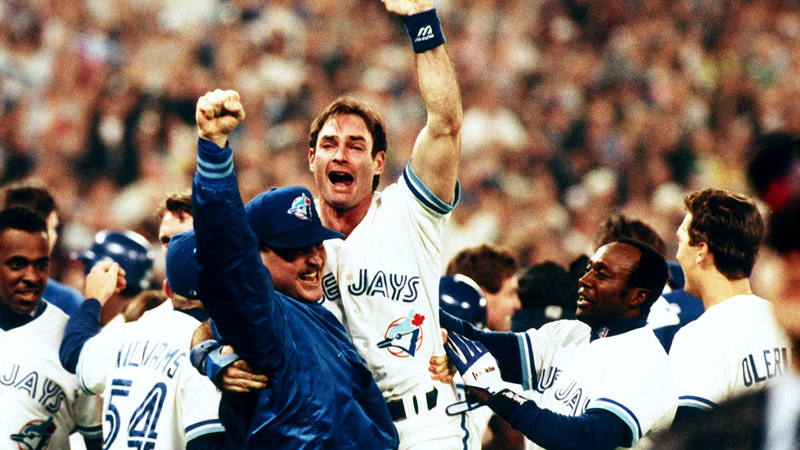 Carter blasted a 2-2 pitch over the left-field fence, and the Blue Jays were World Series Champions for the second year in a row. Carter's homer marked only the second time in 531 Series games that a contest was ended by a come-from-behind homer.